KD Fasteners, Inc.’s stainless steel socket set screws come headless with a drive on top. This feature allows our stainless steel socket set screws to go in flush. Made of stainless steel, these socket set screws are corrosion resistant, durable and versatile. They are ideal for outdoor use and economically priced. 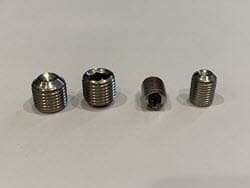 KD Fasteners, Inc.’s stainless steel socket set screws are available in 300 series stainless steel and 316 stainless steel. KD Fasteners Inc. carries a full line of stainless steel socket set screws. They are available in sizes 0-80 to 2 inches. We also manufacture special orders ranging from short runs of 25 pieces to large runs of thousands of pieces. Our stainless steel socket set screws are made in America. Contact us today by calling 1-800-736-5014 or filling out our contact form.